Read the Review: Respected news and review site Apple World Today calls the MCE Complement "a fantastic all-in-one accessory for any modern Mac". See the review HERE! Complement your Mac with the MCE Complement! Blu-ray, DVD, and CD Recordable Drive with integrated 2 TB Hard Drive, USB 3.0 Hub, and SD Card Reader all in one compact USB 3.0 device! Sleek and elegant, the MCE Complement represents the convergence of technologies into one data storage and optical drive solution. 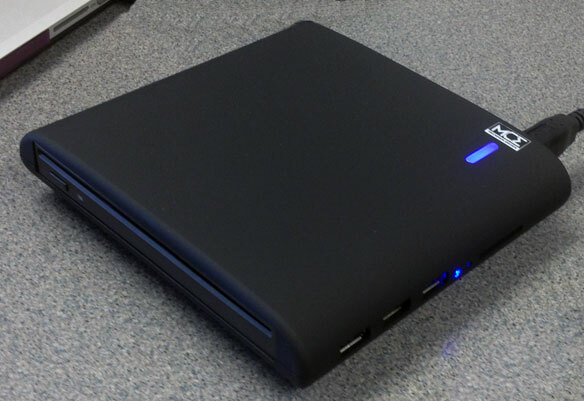 The MCE Complement consists of a 2 TB hard drive for backups and data storage inside an easy-to-access SATA drive bay, a slot-loading optical drive powerhouse that reads AND records to all types of Blu-ray, DVD, and CD media as well as plays commercial Blu-ray movies directly on your Mac with the included Mac Blu-ray Player software, a USB 3.0 hub and an SD card reader... all in one portable, lightweight device that takes up little desk space and operates from one USB 3.0 port with no external power required. Measuring in at just 5.5 x 6 x 1.25 inches, never before has such a sleek, portable, and lightweight device been capable of so much. Compatible with M-Disc 25GB Blu-ray Discs. Archive your documents, photos, and videos permanently! Watch visually stunning commercial High Definition Blu-ray movies right on your Mac! Includes Mac Blu-ray Player Software for watching commercial Blu-ray* and DVD movies on your Mac! Mac Blu-ray Player Software - Full Lifetime License. Universal AC Adapter - for those times when you need to plug in extra power-hungry devices to the Complement's USB ports. 1DVD Studio Pro records to DVD media only. Blu-ray authoring requires additional software such as Toast 14 Titanium with High-Def/Blu-ray Disc Plug-in available as a bundle with this drive.